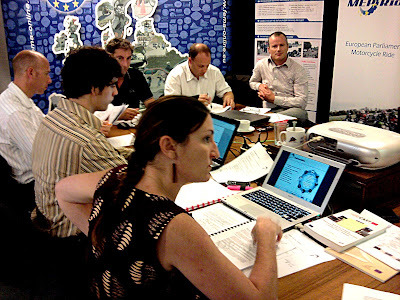 On Wednesday 29th of August 2012 the first expert meeting of the RIDERSCAN project took place. Experts from all over Europe gathered at the FEMA headquarter in Brussels to discuss eight different motorcycle safety areas. The participants of the expert group meeting were Pierre Van Eslande (IFSTTAR) and Andy Mayo (Local Transport Project) giving their input on the topics research and awareness campaigns. The fields training, testing, licensing and national strategies were addresses by Daniel Vandenberghe (CIECA) and Robbert Verweij (Dutch Department for Infrastructure and Mobility) while Xavier Cocu (FEHRL) and Kris Redant (FEHRL) commented on infrastructure. All traffic management related issues were covered by Gabrielle Cross (Mira). The discussion was led by Aline Delhaye (General Secretary of FEMA and RIDERSCAN project coordinator) with the assistance of Jonathan Pfenning (FEMA) who is in charge of compiling the relevant information for the project’s deliverables and the newly created RIDERSCAN database. All experts provided useful thoughts and comments for the further proceeding of the project. A second expert meeting will take place in summer 2014 in order to review the outcome of the deliverables. The RIDERSCAN project is an EU co-funded project aiming at gathering the existing knowledge in 8 motorcycle safety related areas, in order to identify missing knowledge and information and provide guidance to road authorities on how to improve motorcycle safety. The project also expects to foster a new dynamic among road safety stakeholders by advancing knowledge, enhancing communication and better cooperation between the various areas related to motorcycle safety.